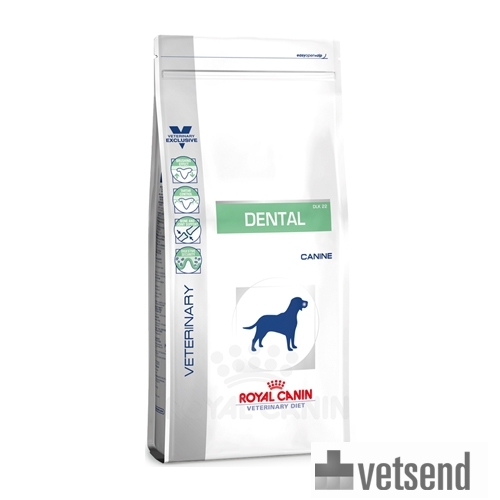 Royal Canin Dental Dog is a dry food specially developed for the care of dogs' teeth. The special structure, size and shape of the Royal Canin Dental food ensures that teeth are cleaned while chewing. Sodium polyphosphate binds to the calcium in the oral cavity and fights against the formation of tartar. The special combination of vitamins and amino acids enhances the barrier function of the skin and protects the body against harmful external influences. The special composition of Royal Canin Dental increases the urine volume and reduces the risk of struvite and calcium oxalate crystal and stone formation. Chondroitin and glucosamine help support joint cartilage. Omega-3 fatty acids help prevent and reduce inflammation and joint pain. Carefully selected, highly digestible protein sources provide optimal digestion in the small intestine. This reduces the amount of stool and reduces flatulence. Helping to eliminate bad breath. Dental disorders are common in dogs and are a major reason for visits to the vet. Often the symptoms begin with the formation of plaque and tartar. If this is neglected, there may be a risk of teeth being lost or having to be removed. It may also cause inflammation in the mouth, or elsewhere in the body. Your veterinarian can treat this by cleaning your dogs teeth while under anaesthetic and removing any loose elements if necessary. Dental problems can largely be avoided through proper and regular dental care (brushing teeth), and by giving special food such as Royal Canin Dental. The size, texture and shape of the kibble encourages chewing, which helps clean the teeth and removes tartar and plaque. Rice, corn flour, dehydrated poultry protein, animal fats, wheat gluten, hydrolysed animal proteins, beet pulp, vegetable fibres, fish oil, minerals, yeast, soya oil, fructooligosaccharides, green tea extracts (source of polyphenols), hydrolysed crustaceans (source of glucosamine), Tagetes (African) extract (source of lutein), hydrolysed cartilage (source of chondroitin). Rice, maize, dehydrated poultry proteins, animal fats, maize gluten, wheat gluten, vegetable fibres, beet pulp, hydrolysed animal proteins, minerals, fish oil, soya oil, fructooligosaccharides, green tea extracts (source of polyphenols), Tagetes (African) extract (source of lutein). This food is also available for small dogs up to 10 kg, Royal Canin Dental Small Dog. Have you used Royal Canin Dental Dog before? Let us know what you think about this product. This food helps Barry to keep dental plaque away and he loves it.